Just a short contribution but I thought you may be interested in the above shots of ex London Transport RLH 32 which looked a real treat at the Oxford bus rally last Sunday 16th October. Ah, the RLH, one of my favourites! Looking forward to seeing RLH 48 later today at Cobham/Brooklands Museum’s first major event at the new museum site. RLH 32 will gladden the heart of Chris Y. ……and it gladdens my heart to see one, too, David, since I recall them, in my three years spent in London, running on the South Wimbledon circular 127 route. The strange thing is, that although they were originally bound for Midland General, I have never actually seen a photo of one in that company’s livery. It certainly looks smart in SL’s livery, though. I had the honour, and I mean that most seriously, of conducting RLH 32 all day and evening on the day of the Samuel Ledgard commemoration – the beautifully restored vehicle represented the four RLHs which Samuel Ledgard operated (RLH2/4/6/8). Free public journeys, massively supported, were operated on Ledgard routes. I wore my genuine uniform which I’ve kept all these years, and used Setright machine SL 40 (I bought it some years ago) and real SL tickets. The day was even more memorable for me, as it was fifty years almost to the day since I started work as an eager young conductor in October 1957. 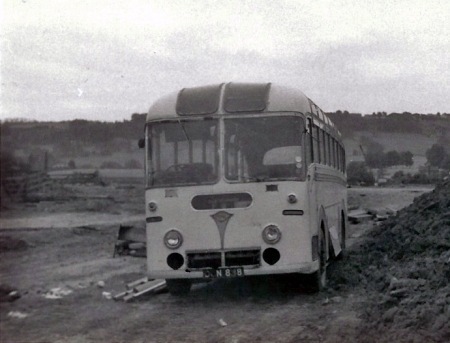 SL 40 was also at our Otley and Ilkley depots throughout its existence. Just to add the final touch of nostalgia to the day preserved ex Bristol Leyland PD1/ECW LAE 13 was present – my first Ledgard bus in passenger service when I started driving in 1961 was LAE 12 !! Its scarcely possible to express sufficiently our gratitude to the gentlemen Messrs Pring for their expensive and superb restoration of MXX 232 and for bringing it all the way north to star in the Day’s events. You can see me in my smart conductors uniform and a shot of RLH 32 whilst way up north at this link. 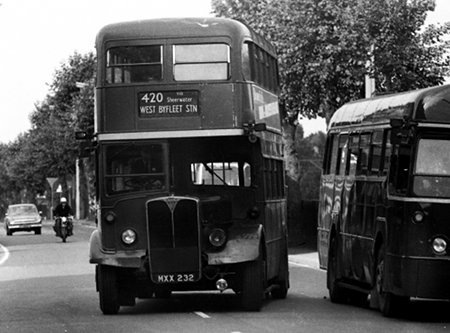 Brooklands was the "very best of London Buses" – and it certainly was. Everything seemed to be in showroom shine condition and there was an excellent cross section of vehicles with a good route network. …..and yes, RL48 was in excellent condition and on top form out on the road. Chris H – I’m not sure any of them actually got to Midland General. They, along with Notts & Derbys, got some rather splendid KSW6G/ECW instead in 1953. They weren’t AEC/Weymann but they rather fine nonetheless. Lovely photos. The Weymann bodied Regent III was certainly a classic and an all time favourite of mine. I travelled home from school daily on Rochdale’s highbridge versions in the early 60’s. Just also noticed the Ford 100E behind in both views was exactly like my first car, a 1956 model acquired in 1965 – ah nostalgia! Here is a picture of RLH 32 taken in 1970 at Woking early in London Country days. It was then allocated to Addlestone Garage, but it didn’t last much longer with LCBS as it was withdrawn in July 1970. The Ledgard RLHs were Nos 2,4,6 and 8, KYY 502/4/6/8, which arrived at Armley between December 1964 and February 1965. Nice to see the bus in Woking, Roger C, a place I had and still have connexions with. They were based not just at Addlestone, but also Guildford Garage, but many of the routes didn’t need lowbridge vehicles at all. always felt that the red livery suited them best. My understanding, David O, was that Midland General ordered thirty, but only took ten in the end, the other twenty going to LTE. DOUBLE DECK – KEEP TO CENTRE OF ROAD UNDER HENSHAW BRIDGE !! I’m afraid this subject always arouses a little hostility in me because I never seem to see these vehicles ascribed correctly. 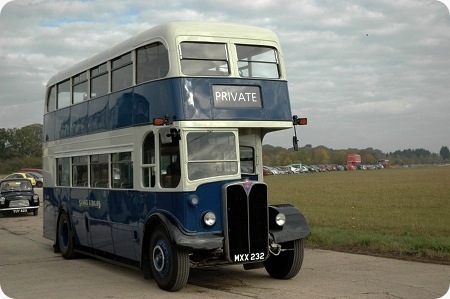 In 1948, Midland General ordered thirty of these vehicles but it was decreed by the British Transport Commission that ten would have to suffice and when they were delivered in 1950, being registered ONU 630-639, the remaining twenty were diverted to London Transport. Midland General received payment from LT for them. The correct description should therefore be (in my opinion!) ‘London Transport’s Midland General type Regents’ Alas, I don’t hold out much hope of this but I’m as nostalgic about one sadly missed blue operator as Chris Y is about another! I believe there were one or two routes in the Chesterfield/Alfreton area that required lowbridge buses. In addition the B8, Nottingham – Mansfield (by a peculiar circuitous route) also required them on account of a railway bridge near Bestwood Colliery. Despite being deprived of the remaining 20 lowbridge Regents, I think I am right in saying that no Bristols reached Midland General until the Lodekkas in 1954. The 15 KSW6Gs delivered in 1953 were actually designated Notts & Derby Traction, to replace trolleybuses on the A1 Nottingham – Ripley service. Actually, when the trolleybuses were withdrawn, the A1 (via Basford) ceased to be the main Riply service, and the KSWs operated on the parallel B1 (via Bobbersmill), displacing, in the main, highbridge preselector Regent IIIs of around 1949 vintage. One of my not very good shots I’m afraid the original is very very dark but it is in colour. 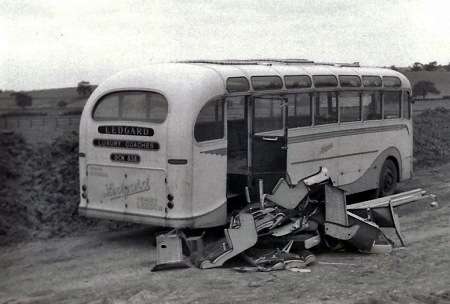 Thx, folks, for the full story (with link and colour photo) of these interesting buses. How different the MG ones look from their LTE cousins, with different destination display, upstairs roof ventilators and square number plate below windscreen. LTE did not change the side windows from the sliding version, though. I only saw MG vehicles when visiting relatives in Chesterfield and don’t recall seeing these at all. MG buses seemed to lurk in this town. Maybe, from the brief glimpses of their vehicles, I didn’t recognise them for what they were. It occurs to me that although Midland General became a constituent part of BTC in 1948 (and failed in its ploy to stave off Bristols for as long as possible!) it managed to keep its livery for many years. What other BTC companies, if any, retained their individual liveries? I exclude London Transport. MG was part of Balfour Beattie – who of course still exist in transport infrastructure (ie railways). They generated their own electricity for Notts and Derby and were thereby nationalised under the nationalisation of the power industry. With respect, I don’t think that the Red and White group of companies was associated with Balfour Beatty. Balfour Beatty certainly owned Notts and Derby, Midland General and Mansfield and District, but Red and White United Transport was a separate group which included, apart from Red and White’s own services, those of Cheltenham District, Newbury and District, South Midland, United Welsh and Venture of Basingstoke. The group sold out its British bus operations to the BTC in 1950, but retained its overseas interests under the name United Transport Company, until it disposed of these to the BET group in 1971. Glad my photos of RLH32 have given pleasure. I was particularly interested in Roger’s photo of RLH32 working out of Addlestone Garage (WY). In the late’60s, I was working at Plessey Radar in Addlestone and spent many a happy lunch hour around the garage. I am sure I must have seen her then, but regrettably have no photos. I have a feeling that the Red & White Group were always independent until voluntarily selling out to the BTC – how they must have cursed, because they were (to the best of my knowledge) the last company to succumb (at least voluntarily) before the Labour Government fell. Cheltenham District were owned by Balfour Beatty until Red & White bought them out a short time before the outbreak of war. It was stupid of me to have forgotten about C & D, which were on my doorstep. As you say, David O, they didn’t stick out so much (and I’m colour-blind)! Cheltenham District had been a Balfour Beatty company but was sold to the Red & White group in 1939. Another BB company was Llanelli & District which was absorbed by South Wales in 1952. Interesting comments about the ordering of these vehicles, Midland General had some very lucrative services and also some very hilly routes. Perhaps the thought of fully loaded buses going up steep hills led them to conclude that the 9.6 litre Regent was a better prospect than what they were destined to receive from Bristol! 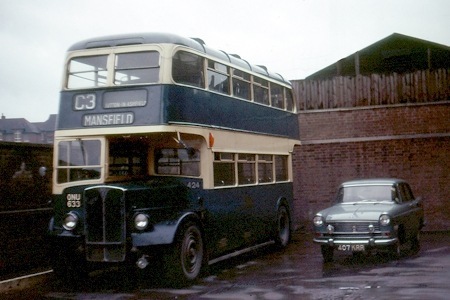 Yes, Midland General can’t have been over-impressed by their first experience of Bristols – in my earlier posting I had forgotten that in 1953 they received three second hand lowbridge K5Gs from Hants & Dorset (two 1939 and one 1940 vintage). Thrashing one of them up the hill from Langley Mill to Heanor market place would have been a slow and noisy experience! About 1963, the 7.7 litre crash gearbox Regent IIs only came out on Saturdays on the Nottingham – Alfreton run (B3/C5). Yet I recall hearing a driver express his strong preference even for these over the everyday Lodekkas. His comment was, "Put one of these [Regents] in first and it’ll climb up the side of a house." I was always told that Red and White was started by the Watts family who I believe are still in business as tyre fitters. Correct: Watts of Lydney, Glos., are a very large tyre company with a global presence,including aircraft, fork lift truck and industrial tyres. London Transport had to pick their bus garages carefully when they received their austerity buses during the war, as they were taller than the usual LT spec. Their garages were inherited from a motley collection of past companies and fortunately some had high-enough entrances to cater for them. Most Guys finished up in East London and most Daimlers in Merton/Sutton Garages. This might be one for Chris Youhill (who’s postings I’ve followed on other sites): why work for Ledgard’s, as opposed to LCT, BCT or WYRCC? I suppose location might be a factor: only Ledgard had a depot in Otley or Yeadon, but in Bradford surely BCT offered better working conditions? Similarly in Ilkley wouldn’t WYRCC have offered better conditions than Ledgard? And couldn’t Armley-based staff have travelled on the frequent LCT services to LCT’s Bramley depot? WYRCC/BCT/LCC all ran more modern fleets . . . What was it that tied staff to Ledgard’s? And, for that matter, why did staff in any town with both a company and "corpo" depot (Halifax for example) choose the former over the latter – location of depots? or what?? Well there’s another cat put among the pigeons, Philip! While Chris Y is getting steam up (for which I am waiting with baited breath! ), I’ll throw in my pennyworth. All sorts of reasons. Leaving aside the political “labour/public versus conservative/private” debate, different operators created different impressions and reputations for themselves. “Xyz is a lousy company and I wouldn’t work for them if they were the last employer on earth” etc. You will know from my comments elsewhere that I was a fan of Nottingham City Transport – it always seemed efficient and competent, and its buses were usually well-kept – even the older ones. BUT NCT had a reputation – they waited for nobody. With the conductor on the platform, they would ring off with you no more than three paces away, and a pre-selector Regent , second gear engaged and held only on the footbrake would take off like a greyhound. You stood no chance! Barton’s on the other hand, and South Notts too, would wait for any runners, and their conductors were generally more considerate, helping with pushchairs, luggage etc. Obviously there is more scope to re-coup time on longer interurban journeys, so in a way this is understandable. On the other hand, Barton as an employer had a reputation for being high-handed. The company belonged to the family, and any driver who damaged a bus got his marching orders. Obviously staff who were also enthusiasts might have their own reasons for wanting to work for this, rather than that operator – especially those that ran varied and interesting fleets. And don’t forget that in the 1950s and 60s there was a degree of government control over pay through the Ministry of Labour’s Wages Inspectorate – so it was not necessarily a case of small private operators paying significantly lower wages. Many full-time employees of smaller, private companies started as part-timers, something not countenanced by most of the larger companies – except in Scotland. In the Halifax case, Philip, and very probably in other Corporation v Company scenarios, the influencing factors were the higher standards of wages and conditions on the municipalities. Stephen mentions the high handed attitude to staff from the Barton management the same autocratic attitude was practised by Samuel Ledgard prior to his death in 1952. There are many apocryphal stories about his attitude to staff. One is of a guard being sacked after Mr Ledgard saw him riding a motor bike and told he was not paid enough to have such a machine and he was sacked! Another is when an elderly passenger told a crew they were running early. The guard told the passenger it was"nowt to do with thee" The next day the man was summoned to see Mr Ledgard aka the old man. Leeds corporation were also strict although higher pay was the norm with numerous stringent fines and restrictions for transgressors. I was most amused by Stephen’s accurate expectation that I shall be "getting steam up" and he won’t be disappointed !! However I’m going on holiday for ten days or so and therefore I’ll write it when I get back. The matter of staff loyalty to independent operators is a complex one and I should be able to outline many aspects which will, I think, surprise Philip. In answer to Philip’s query of the 26th Ultimo (as "last month" used to be referred to in the days of quills and ink) I think that, to avoid writing a complex book here on OBP, I can sum up the subject in two simple words – "JOB SATISFACTION." In the case of the Samuel Ledgard undertaking it was of course not the usual small independent operator but was a large concern with five depots, or to be strictly accurate four depots and one "running shed." The Firm was a very good employer indeed and paid wage rates well above what was necessary, but quite reasonably in return insisted rigidly that "the job was done properly" – as a minority who thought otherwise soon found out as they queued at the Labour Exchange !! The network of busy tightly timed services was an interesting one, varying between well patronised interurban routes through local town facilities to medium length outer district forays. Comprehensive rotas were in force at all depots and all staff worked interestingly on all routes operated from those premises. The Contract, Private Hire, Express Service and Excursion functions were thriving and varied. The fleet was quite magnificent in its variety of chassis and bodywork makes and models – new and, after the demise of the Founder Samuel, second hand. 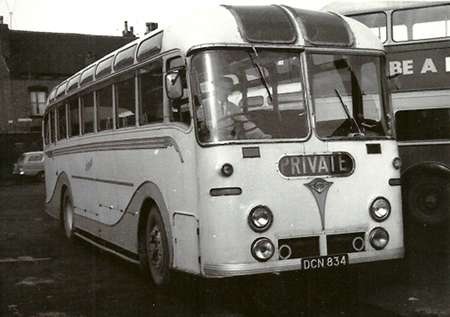 A duty could easily involve a new synchromesh AEC, followed by a new or second hand manual Leyland PD and, later in the day a preselector Daimler (new or "previously owned") – and perhaps an Albion Valkrie or a 1930 ex Birmingham Regent 1 very successfully posing as a Burlingham veteran luxury coach/maid of all work thirty years "new." Well, enough of the nostalgia which really made the job so very enjoyable and varied. It must be stressed that the Firm’s services were so totally reliable, and greatly appreciated by the Public, that such a level has never been seen in the area since and is still greatly missed. 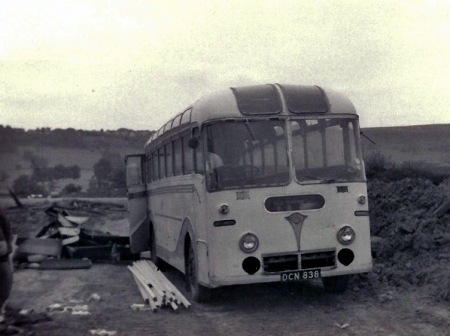 The vehicles, regardless of pedigree, were superbly maintained by very proud craftsmen staff and well treated by drivers with a pride, and ANY lost mileage (which was so rare as to be a sensation followed by a searching enquiry) was regarded as a very serious matter indeed and was virtually never caused by a breakdown. Yes, the Municipal and Group operators may have appeared to offer better conditions and in some ways did, but some of their modes of operation were the road to boredom and insanity. I have also worked for Leeds City Transport where OPO drivers or crews lived on the same route year in year out and, in the case of the crews, with the same "mate" day in day out. This system encouraged widespread work dodging as a science by those so inclined of whom there were plenty (classed conceitedly by themselves as "fast men" which in reality meant gearbox, flywheel and diff wreckers) and double the work for those who wouldn’t lower their standards. I also worked for West Yorkshire at Ilkley which was better, as you did all the routes and had a different colleague every week. I finished my career for the last fourteen years with the Pontefract family owned firm of South Yorkshire – in effect a miniature version of Samuel Ledgard’s – where good wages were paid and the vehicles were also superbly maintained, and everyone worked all the routes long and local. By the way Philip, just a small point, but West Yorkshire did in fact have a depot in Yeadon High Street. So, there you have it, I’ve tried to explain as briefly as possible "Why work for Ledgard’s" – believe me I wish I could turn back the clock to October 1957 and start all over again – as Mr. Sinatra famously sang "I did it my way." Nice to see you on the platform of D213/HGF 690, which Sam’l Ledgard had from 1954 to 1960. I’d like to have seen them in SL’s excellent livery. Did you start as a conductor and work up to driver? I think your reply was very appropriate. Within reason, pay is less important than job satisfaction and a good employer encourages a loyal and stable workforce. And you were lucky to have lived in an era of buses of various ages, makes and technical differences. It needed skill and empathy to drive a vehicle with a crash, then synchromesh gearbox, then a pre-selective gearbox, and make a good job of it. My abiding memory of these buses was how imposing they looked from the outside, being very tall at 14′ 6", and spacious inside, due, I suppose, to their high roofs. they sported LT’s three-piece indicators, which was unattractive at the rear, seemingly stuck on with glue! Looks as if SL unstuck them from the above photo! Thanks Chris Hebbron – yes the London Sutton depot "HGFs" were a fine model full of real character. 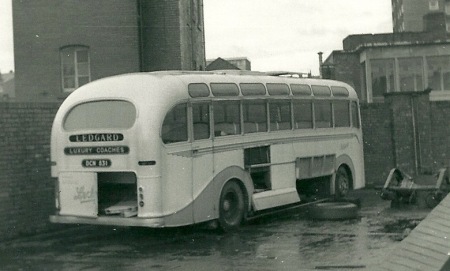 One hundred of them were delivered between May and November 1946 – Daimler CWA6/Park Royal. In 1953/4 we acquired no less than twenty two of them at a time when the prewar fleet had to be replaced – they performed heroically and handled heavily loaded services punctually and reliably on very harsh roads. They retained a lovely London feature in the cabs above the windscreens, in Gill Sans lettering, "DOUBLE DECK- HEIGHT 14’6" To my utter amazement they were apparently the first London buses to feature a continuous cord bell in the lower saloon – I was always under the impression that this had been a London feature !! The sound emitted by the cab roof buzzer to indicate that the upper saloon bell push was being used was sheer joy, and bestowed a most beneficial free foot massage on the front seat passengers up there. 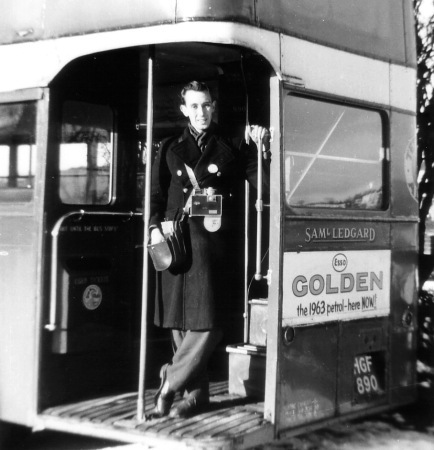 The picture was taken at Ilkley in December 1957 in my second month as a conductor. The Firm did not teach people to drive, and so I obtained my PSV licence elsewhere before eagerly returning to where my heart lay, and my first duty as a driver was a late turn on a Friday on the very busy Leeds – Guiseley – Ilkley service. 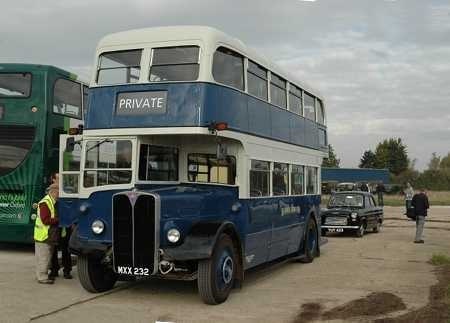 The bus was ex Bristol Leyland PD1/ECW LAE 12 which behaved like a dream and performed like a trooper. Chris et al, sorry! I’ve only just stumbled on your replies to my question: the answers were, quite frankly, staring me in the face. Thank you all for all these wonderful postings … and a special thank you to the delivery driver of one ex LT RT, who stopped and rescued me and other hitch-hikers from freezing to death at the side of the A1 back in November 1963. He dropped me at the baths on Kirkstall Road having turned left on his way to the Armley Depot. It was a slow ride in thick fog.